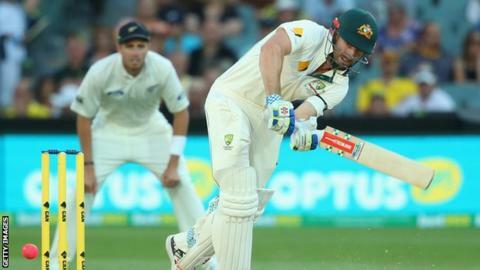 Australia sealed a 2-0 victory in the three-match series against New Zealand with a three-wicket win in a gripping inaugural day-night Test in Adelaide. Trent Boult took 5-60 but Shaun Marsh's 49 and 28 each from Adam Voges and Mitchell Marsh proved decisive. Josh Hazlewood took a career-best 6-70 to help dismiss New Zealand for 208. All of the real drama, though, was reserved for the evening when, for the third day running, the extra swing of the pink ball ensured a regular fall of wickets. Boult was the main beneficiary, adding a five-wicket haul to the 2-41 he claimed in the first innings to keep an increasingly nervous home side and crowd on edge throughout what had seemed a straightforward chase. In the absence of Mitchell Starc, who has been unable to bowl or field since injuring his foot on Friday, Hazlewood came to the fore, spearheading the Australia pace attack in impressive fashion. The 24-year-old helped the home side dominate the first session, getting them off to the best possible start by dismissing BJ Watling - caught at slip by Steve Smith - before the Kiwis had added to their overnight lead of 94. Hazlewood completed his five-wicket haul when he had Mark Craig caught behind for 15 to leave New Zealand 140-7. After spinner Nathan Lyon had Mitchell Santner, the innings' top scorer with 45, stumped and all-rounder Mitchell Marsh claimed a third wicket by having Tim Southee (13) caught pulling at deep backward square, Hazlewood finished New Zealand off by bowling Boult. Doug Bracewell was the last man standing, his 27 not out helping the visitors set a modest target of 187. Wary of a repeat of the extra swing generated by the pink ball in the first two days of the Test, Australia set about their chase in an urgent fashion, amassing 34 runs in five and a half overs. Their progress was checked, though, as Boult began to capitalise on the increased movement to trap Joe Burns lbw for 11. The Kiwi seamer repeated the trick to dismiss Australia captain Steve Smith, shortly after David Warner had edged Doug Bracewell to Southee at second slip following a typically rapid 35 from 37 balls, to leave the home side vulnerable at 66-3. Voges and Shaun Marsh steadied the ship with a resilient partnership of 49 - the third highest of a low-scoring match - before Boult struck again, dismissing the former by finding an edge that was again taken by Southee at second slip. Having lost partner Voges, Shaun Marsh showed superb resilience to forge another important partnership with brother Mitchell. The pair put on 46, taking Australia to within 26 runs of victory before Mitchell departed, caught off a top-edge by Kane Williamson from the bowling of Mitchell Santner. Shaun Marsh added 15 more crucial runs with Peter Nevill before he too fell, caught at slip off Boult, to silence the crowd and bring Peter Siddle to the crease. Boult provided one more twist, getting Nevill to nick one to a diving BJ Watling, but Siddle and the limping Starc finally saw Australia home. Was day-night Test cricket a success? Read more on Was day-night Test cricket a success? Can floodlights save Test cricket?